In 2009, Josh Kace and a group of jerky-enthusiast friends decided that they deserved a better jerky experience. They gathered under the slanted roof of a New York City apartment and a dream was born: tender beef jerky made from 100% grass-fed beef, organic spices, and non-GMO, preservative-free marinades. The mission at Slant Shack is to create a delicious, nutritious snack made from whole, quality ingredients. SlantShack is a Certified B Corporation meaning they incorporate social and environmental concerns into its business goals. They collaborate with third-party certifiers to ensure that all of their suppliers adhere to the highest standards for animal welfare and sustainable agricultural practices. 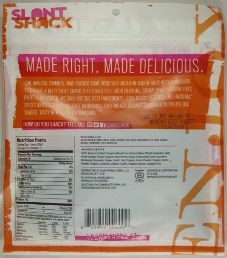 Slant Shack jerky is distributed under the name of Slantshack Jerky, LLC., and they are located in Brooklyn, New York. 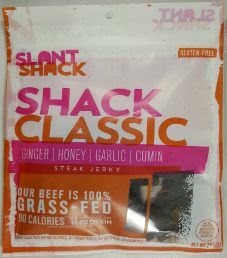 The first review on Slant Shack will focus on a 2 ounce/56 gram bag of their Shack Classic flavored 100% grass-fed beef jerky. The bag was kindly submitted for review by co-founder & CEO David Koretz. Slant Shack is guaranteed to use 100% grass-fed beef. As a result, the cattle are guaranteed to have free range access, and be ethically raised. Therefore, the ingredient rating starts at an Excellent (10/10) rating. The liquid marinade used here consists of a high quality brand of organic wheat-free tamari soy sauce, healthy vinegar, and locally sourced honey. organic cayenne pepper, and organic cumin. The sugar level is a bit on the high side at 4 grams of sugar per 28 grams of sugar to lose a rating. Our preference is 3 grams of sugar per 28 grams of sugar for an original based flavor. The salt level is sort of on the high side at 450mg of salt per 28 grams of jerky. However, a healthy untreated sea salt is used where the salt levels are therefore ignored. This jerky does qualify to have no sodium nitrite, or any other similar unhealthy preservatives. Instead, salt is the main preservative used. Admirably, this jerky qualifies to have no MSG added. The Slant Shack – Shack Classic 100% Grass Fed Beef Jerky is a very tasty snack, this jerky is moderately salty with a good punch of soy. It may arguably be too salty for some and we’ve all found the saltiness to still be at a reasonable level. The saltiness gives this flavorful treat more “umph” and personality. This flavor also displays a rich and unmistakably good quality tamari soy sauce. Some may refer to this flavor as “umami” which has loads of it. The umami taste is followed with an almost “fruity” flavor, as it keeps building and adding to this already multi-faceted flavor profile. There is a respectable amount of natural beef flavor while some other flavors such as garlic, ginger and onion are lighter and still present without overtaking this Shack Classic/ Original flavor. The sweetness is also light and as a bonus, the honey comes through nicely. The cumin taste is present although not quite evenly distributed between each piece. This explosion of taste culminates with a slight splash of vinegar and the acidity makes all these flavors “POP” in your mouth. These pieces are between small right down to crumbles and they are medium in thickness. The aroma is pleasant and inviting while the texture is fairly soft, tender and easy to chew. In any case, this jerky displays a fairly extensive and bold blend of flavors. These flavors are well-balanced and sing in unison without really competing with each other. 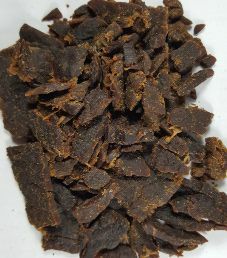 This is definitely an addictive jerky that will leave you longing for more. 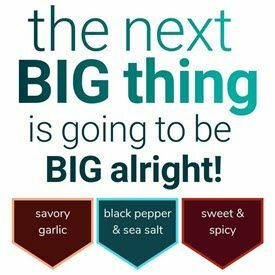 The Slant Shack – Snack Classic 100% Grass Fed Beef Jerky is highly recommended to fans of Original flavor or perhaps someone wishing to test the water before plunging into more extreme or bolder flavors. We’ve awarded a 9/10 taste rating. A case of 8 2 ounce/56 gram bags sell online for $45.99. That works out to $2.87 an ounce, which rates as an cheap price considering that 100% grass-fed beef jerky is used. This plastic non-resealable bag has everything imprinted on the front, and nothing on the back. Slogans printed on this bag are “Made Right. Made Delicious” and “Our Grass is 100% Grass-Fed”. Some facts printed on this bag are “Gluten-Free”, “Ginger|Honey|Garlic|Cumin”, “Beef Used Has No Antibiotics, No Hormones & No Artificial Ingredients”, and “90 Calories & 14 Grams of Protein”. The question is posed “Why Grass-Fed?”. The answer given is “Slantshack Only Used 100% Grass-Fed Beef Because It Is Free Range, and Never Confined to a Feedlot”. All bag categories are covered with this bag. There is a good blurb on the back describing Slant Shack. 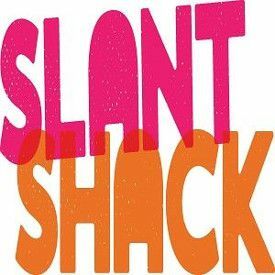 You are encouraged to follow Slant Shack on Facebook, Twitter, and Instagram. A stamp is displayed designating that Slant Shack is a Certified B Corporation.